21st March is celebrated as the International Day of Forests. This is the day that we commemorate one of the most diverse and most important natural resource that we have: the vast woodlands that once covered the earth, and are now fast disappearing. Indeed, it is alarming at how fast the forest cover of the earth is diminishing. It is alarming because the forest is possibly the single most important resource for us humans, and alarming also because it is a sign of our callousness and negligence that we are allowing these regions to disappear forever for some momentary gains. The faster we lose our forest cover, the faster we are hurtling toward extinction as a species. The forest is not just about the trees and the animals, although their place cannot be undermined; we, as a species, depend more in our daily lives on the forest than we think. To begin with, the forest forms the biggest place for habitation for a great multitude of animal species. As we keep cutting down on our forests, these animals lose their home, and also their source of food and a place for procreation. Each one of these animals play an important role in the entire ecological system, and as they face extinction due to habitat loss and lack of food, we run the risk of seriously compromising the very ecosystem we live in. As humans, it would be impossible for us to break free of the ecological order of things, and hence we are also affected in some way or the other as a reaction of the threat these species face. For instance, bugs and worms help in keeping the soil fertile, and bees- the most important sources of some very expensive and very necessary products, honey and wax- thrive in the forest. The importance of the forest in maintaining a livable atmosphere cannot be undermined. It is a well known fact that trees keep the temperatures down. As more and more trees are being cut down, it is adding to the global warming by raising temperatures further. A greater number of cars and industries means that more carbon dioxide is being released into the world, and there are not enough trees to process all that and turn it into oxygen. Trees also help in holding the soil firmly together; reports of huge landslides are becoming commoner as deforestation loosens the soil. The forest is crucial to maintaining balance in the economy. A staggering number of industries are dependent on the forest, and they employ millions of people across the world. Besides, products received from the forest, either directly or indirectly, are exported and imported regularly, which adds to the revenue of the exporting nation. It is, indeed, one of the factors that contribute heavily to the economic growth of a country. For instance, the furniture and wooden products industry is completely dependent on the forest. 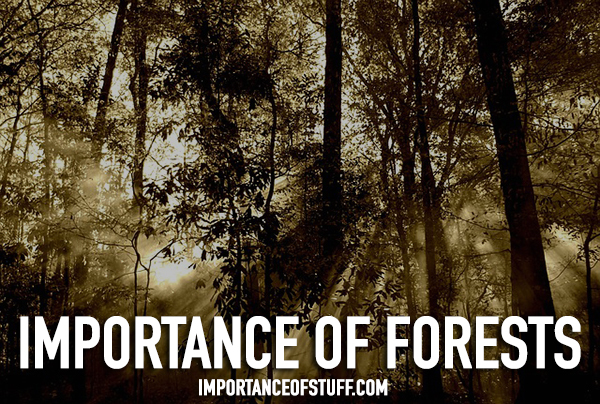 Forests are not just home to a wide variety of animals, birds, and insects. They are also home to a huge indigenous population, all of whom face extinction and habitat loss with the loss of the forests. Just like the animals that have known the forest as their home for thousands of years, these humans also find it incredibly difficult to adjust to a life outside of the forest, and even more difficult in an urban area that is increasingly taking the place of their natural habitat. The more we push these indigenous people out of their homes, the less ethnic diversity we have in the world. By threatening the indigenous population with extinction, the urban population keeps hovering on the brink of forever losing some very important and ancient cultures of the world. Stripping the earth of its forest cover poses an incredible amount of danger for us. We have to depend on the forest for many obvious things- like the climate we live in, the soil we tread on, the air we breathe, and the furniture and gas that we use to make our lives more comfortable. But there is more to it; we also use forest byproducts in other things that form an integral part of our lives, such as medicine and cosmetics. Yet, we continue to cut down trees to make way for more living quarters and industries for humans. This is a classic exemplification of the story of the golden goose; we are killing the very goose that lays golden eggs in a bid to get the most out of it at one go, without bothering about the future.